Traditionally, these crops are maintained as plants in the fields in potentially vulnerable conditions exposed to pests, deceases and environmental fluctuations. 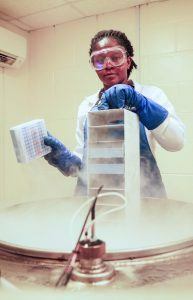 To mitigate those risks, some crops can be conserved in in vitro genebanks (link to the in vitro page). Yet in vitro conservation is cost- and labor- intensive and requires regular material transfer to a fresh growth media. Another challenge is the risk of somaclonal variation: spontaneous mutations caused by artificial growth conditions and some chemicals added to the growth media. Takagi H, Thinh NT, Islam OM, Senboku T, Sakai A. 1997. Cryopreservation of in vitro -grown shoot tips of taro (Colocasia esculenta (L.) Schott) by vitrification. 1. Investigation of basic conditions of the vitrification procedure. Plant Cell Reports 16: 594–599.